“I have two students that clinic with me and do a lot of work on their own. They individually found your $24/month Video Classroom. [This] has helped them SO MUCH. Your help has enabled them to relax, and relax their horses. It has shifted their perspective from “must do” to observing their horse, and observing themselves. “I have two students [who] individually found your Video Classroom. [This] has helped them SO MUCH. Your help has enabled them to relax, and relax their horses. 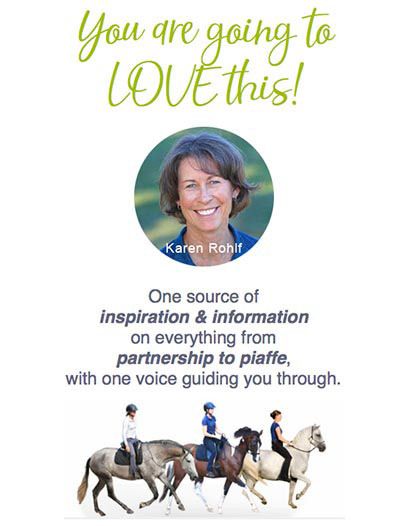 It has shifted their perspective from “must do” to observing their horse, and observing themselves…The major impact and improvement I have seen in their awareness and relationship with their horse has made me a believer…Thanks for all you are doing!”. 1. Basic Information Already have an account? After the first month, you will be automatically billed $24 every month until you cancel. You can cancel at any time. Then, if nothing happens for several seconds, you may need to 'allow popups' in your browser in order to display the PayPal payment page. PayPal users, you may need to 'allow popups' for 'dnc.dressagenaturally.net' in order to display the paypal payment page. We've found that the Chrome web browser works best for the subscribe process. Although rare, sometimes there is a problem in creating your subscription. If this happens, please contact us and we will assist you right away! Email us at dnc@dressagenaturally.net and include your name and email address. In addition, please tell us about the problem you encountered and include the text of error messages you see, if any. The error messages appear at the top of this web page (if there are any) after you click the "Subscribe" button.